Who says Las Vegas has to be expensive? There's plenty of free things to do! Traveling with your entire brood can start to get expensive, especially when taking the family to a destination like Las Vegas. Dotted with casinos and high-end hotels, the Las Vegas Strip isn’t exactly known for its bargains. Fortunately there are plenty of ways to save money around Las Vegas that’s fun for both parents and kids alike. I’ve put together a list of free family friendly activities in Las Vegas that will keep you entertained on a budget! The 14,000 square foot floral wonderland at the Bellagio Conservatory and Botanical Garden features an ever changing scene of fun, beauty and creativity. With each season new flowers and designs are brought in with breathtaking displays. Fun tip, if you get there early enough (before 7:00am) you can see the horticulturalists changing out the dying flowers for fresh, vibrant new ones throughout the display. Want more ideas, discounts and deals around Las Vegas for your family? Get Las Vegas show and hotel discounts here…. As a local, I have so many fond memories of my dad taking me to see the circus acts at Circus Circus. Little did I know that it was my dad’s way of entertaining me for free. With world class acts that include jugglers, trapeze artists and more you’ll be entertained for hours. Talk about an oasis filled with mystique and beauty in the middle of the desert! The 117,000 gallon aquarium at the Aquarium and Mermaids at the Silverton features a variety of tropical fish, sharks and other sea life. Thursday-Sundays you will also be able see live mermaids take to the water to interact with spectators. If you’re anything like me then you might be obsessed with chocolate. Ethel M Chocolate Factory is one of my favorite places to visit. When at the factory you can walk down a viewing aisle and overlook as chocolatiers create gourmet chocolate right in front of you. At the end of the self guided tour you can take a walk around the chocolate shop that’s filled with gourmet chocolates and brittles. Don’t forget to grab your free sample! Located in the Forum Shops at Caesar’s Palace, this animatronics show is as entertaining as it is educational. The intense display of fire and water tells the mythological story of the city of Atlantis as two 9-foot-tall sibling statues battle for control. The Fall of Atlantis at Caesar’s Palace show runs at the top of every hour starting at 11:00am daily. See water like you’ve never seen before, dancing and lit up to a variety of music from Broadway hits to pop music. Located in front of the Bellagio, this 8.5 acre lake has 1,214 jets that shoot water over 450 feet into the air all choreographed to music. The Fountains of Bellagio is classy entertainment on a budget. 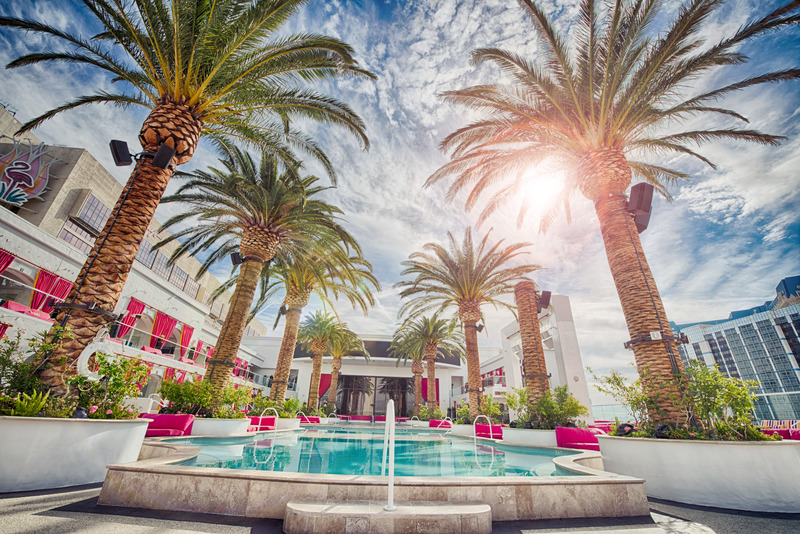 Need ideas for kid-friendly hotels in Las Vegas? We’ve got 10 of them. Do you want to go to heaven? How about a four-story chocolate heaven? M&M’s World will offer an unforgettable experience for both you and the kids. On the first floor you’ll find souvenirs and memorabilia galore – from key chains to coffee mugs they have everything M&M you could ever want. The second floor is a feast for the eyes with a rainbow wall full of 22 different M&M colors, every color from pink to grey. The third floor is every kid’s favorite with a free interactive movie and short film, “I left my M in Vegas” (10 minutes) about how Red gambled his M&M away and now him and Yellow are on a mission to get it back! The fourth floor has a NASCAR theme with the M&M’s sponsored Toyota Camry parked in the middle of the floor and a cache of NASCAR merchandise surrounding it. The Container Park one-of- a-kind play area opened in December of 2013 and was constructed with 43 re-purposed shipping containers and 41 locally manufactured Xtreme cubes. It includes a tree house with a 33-foot-tall slide! The play area features a NEOS play system to get your kids moving and to have fun doing it! While the kiddos are having a blast in the gated playground, mom and dad can go to all the boutique shops for a little shopping and grab a meal at one of the many dining options. Throughout the year they have live entertainment for the whole family to enjoy. How about a quick trip to Italy? Head over to St. Mark’s Square at the Venetian and you can come pretty close. With an all day lineup of opera singers, jugglers, living statues, and more you will be entertained and transported to the Italian Renaissance. Grab some gelato or coffee from the nearby cafes and relax while being entertained. For almost 30 years, the world famous Volcano at the Mirage has been lighting up the Vegas strip with an intense fire show orchestrated to music. From the same creators as the Bellagio Fountains, this show includes 12 foot flames that shoot into the air, coordinated fire spouts, water and smoke effects. Located in McCarran International Airport, The Howard W. Cannon Aviation Museum walks you through Vegas’ local history of aviation. Learn more about the the history of McCarran airport (originally known as Anderson field), the first flights into Vegas and how the airport has evolved since the 1920s. If you are lucky enough to be in Vegas the First Friday of the month you can head over to the downtown area for a night of art, entertainment and food trucks. This foundation brings local artists from all over the city together for a night of creativity, community and fun. Just south of the Strip is the Shelby American World Headquarters. They have a free car museum that takes you from the first Shelby ever created to the most current model and creation. Their guide, Jim, knew Carroll Shelby personally and tells you story after story of one of the most iconic figures in automotive history. You can also walk up to the glass walls in the Heritage center that overlook the shop where you can watch the technicians build custom Shelbys. Don’t forget to sign your name on the wall with a Sharpie to let the world know you were there! Visiting this famous sign is now safer than ever thanks to the latest addition of a small parking lot right in front of it. Come by, park and get your picture taken with one of the most iconic signs!